Have you noticed that marshmallows have gone gourmet? No longer do we have to content ourselves with those tasteless cylinder-shaped white blobs that come in a plastic bag. Oh, I know as kids we loved their spongy texture and sweet flavor. And who can deny how perfect they were for making rice crispy squares or S'mores. But for eating on their own, nothing compares to the sweet vanilla scented airiness of homemade marshmallows. You will find that once you start making your own there is no going back. Every time I make homemade marshmallows, I am surprised that only a few ingredients are needed to make this candy. Just gelatin, water, sugar, corn syrup, and vanilla extract. Marshmallow making begins with gelatin as this is what gives the marshmallow its thick dense spongy texture. In order for the gelatin to do its job properly, we need to first soften it in cold water. Then, while the gelatin is absorbing the water and becoming nice and spongy, we need to start making a cooked sugar syrup. This involves cooking sugar, corn syrup, water, and salt until it reaches the soft ball stage (240 degrees F) (115 degrees C). Once this is done the two mixtures (gelatin and sugar syrup) are combined and whipped until thick and fluffy. What is amazing is how this mixture starts out opaque in color, yet gradually transforms itself into this shiny and thick white fluff that looks like a meringue. Only, unlike a meringue, the marshmallow is very sticky so you will need a damp offset spatula or rubber spatula to spread it into the pan. The pan has to be lined with parchment paper and dusted with confectioners' (powdered or icing) sugar to ensure easy removal. And the marshmallow does need time to set; about 12 hours at room temperature. I find it best to use either clean kitchen scissors or a pizza cutter (wheel) to cut the marshmallow into squares and be sure to dip the cut sides of each marshmallow into confectioners' sugar so that all the sides are no longer sticky. The marshmallows will keep in a cool dry airtight container for about two weeks. Once you are comfortable making your own marshmallows, you may want to try experimenting with this recipe. You can substitute almond extract (1/2 teaspoon) or mint extract (2 teaspoons) or even lemon extract (2 teaspoons) for the vanilla extract. Another idea is to add a little food coloring to make them say, orange for Halloween, pink for Valentine's Day, or green for St. Patrick's Day. And if you want to coat them in something besides confectioners' sugar, try using toasted coconut, cocoa powder, or even toasted and ground nuts. Of course, you can cut the marshmallow into other shapes besides squares, simply by using your favorite cookie cutters. 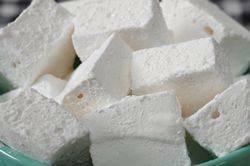 Homemade Marshmallows: Lightly butter, or spray with a non stick vegetable spray, the bottom of a 13x9x2-inch (33x23x5-cm) baking pan. Line the bottom of the pan with parchment paper. Then sift about 3 tablespoons of confectioners' (powdered or icing) sugar onto the bottom of the pan (this will help release the set marshmallow from the paper). Scrape marshmallow mixture into the prepared pan and spread with a damp offset spatula or rubber spatula. The mixture is very sticky so just smooth it out as best as you can. Dust the top of the marshmallow with another 3 tablespoons of confectioners' sugar and let stand, uncovered, at room temperature until set, about 12 hours. Remove the marshmallow from the pan by first running a small sharp knife around the edge of the marshmallow to loosen it from the pan. Invert the pan onto a large cutting board that has been dusted with confectioners' sugar. You might have to use your fingers to help loosen the marshmallow from the pan. Peel off the parchment paper (the marshmallow will be sticky) and dust the top of the marshmallow with confectioners' sugar. Cut the marshmallow into squares using clean kitchen scissors, a pizza roller or a sharp knife. Dip the cut sides of the marshmallows in additional confectioners' sugar. Shake off excess sugar and store the marshmallows in an airtight container, at room temperature, for up to two weeks. Makes about 24 - 2 1/2 inch (7.5 cm) marshmallows. Jones, David. 'Candy Making for Dummies'. Wiley Publishing, Inc. Hoboken: 2005.